It’s an inauspicious number. That’s ‘13’. The Maithripala-Ranil Regime (or Ranil-Maithripala Regime if you will) is in its 13th week. 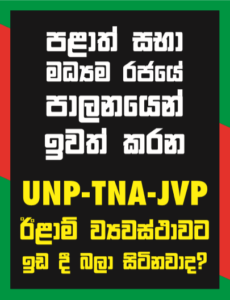 It’s the worst so far for Prime Minister Ranil Wickremesinghe and the United National Party (UNP). First, a proposal for obtaining 400 billion rupees through Treasury Bills was defeated in Parliament. According to some constitutional experts the defeat of this kind of ordinance amounts to a no-confidence motion. Tradition, thankfully for Ranil and the UNP, is (conveniently) not the strongest suit of our Parliamentarians. Fortunately too, the Sri Lanka Freedom Party (SLFP), headless (in Parliament), is so confused that it doesn’t know if it is in the Government or the Opposition. It was left for Dinesh Gunawardena to make the point. Tellingly, the SLFP, the party with the numbers in Parliament, didn’t pick it up. The ‘loss’ however will not go unnoticed. Productive day in Parliament, with the first reading of two amendments to the Constitution that I had proposed, seconded by Upeksha Swarnamali. The 24th, which is the more important I think, is about making Secretaries to Ministries Permanent, and restoring their appointment to the Public Service Commission. I hope that all those who are keen on independent commissions will accept that these will have no teeth if the most important appointments in the Public Service are left in the hands of the Executive.